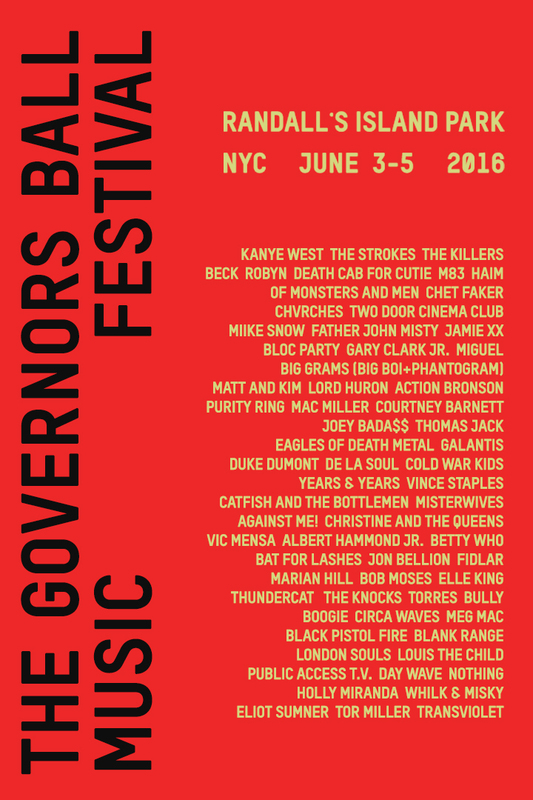 Who’s Coming to Governors Ball 2016 With Me? So, who’s coming with me to Governor’s Ball? I went to the festival in 2014 to see the headlining, reunited Outkast as well as the superb supporting cast. This year’s lineup might be even better in all honesty. And trust me, I’m not just saying that because our supreme leader Yeezus is the lead headliner. The last time Kanye West headlined Governors Ball he released Yeezus shortly after. He even premiered a few of the songs at the festival. So as someone that’s been waiting patiently for SWISH for as long as possible this is the best possible news that the album is soon to drop. Well, that and the potential return of GOOD Fridays. But then you also get The Strokes and The Killers as headliners, and frankly since I missed The Strokes in 2014 I’d want to go just for “Reptilia” alone. Then you’ve got Beck, Haim, Of Monsters and Men, Chet Faker, Gary Clark Jr, Miguel, Matt and Kim, Action Bronson, Joey Bada$$, Eagles of Death Metal, and tons more in the lineup above. To say I’m salivating is an understatement. So, who’s gonna be my wingman/woman(s) this time around?